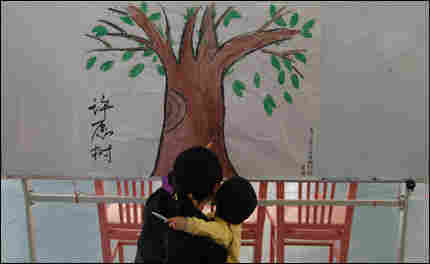 Placing Wishes on the Tree of Hope : Chengdu Diary As the earthquake anniversary nears, how people are marking the sad day. Though the date on this entry will read May 11th, it is in fact the morning of May 12th here in Chengdu, the one-year anniversary of the Wenchuan earthquake. Yesterday, I had the chance to see a small commemorative event, held at one of the Big Top tents set up by the group Half the Sky. Half the Sky was originally founded to help orphans in China, but after the quake, they set up recreation centers for children in six temporary camps in Dujiangyan. That later evolved into all-day preschool for several hundred kids, and a weekend rec center for older kids. 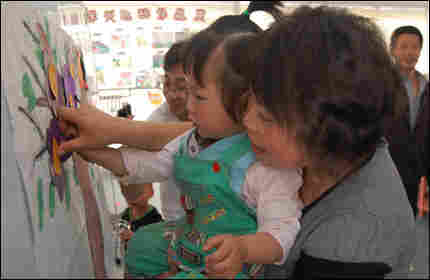 At the Gaogeng camp yesterday, nursery school teachers invited parents and grandparents to join their two and three year olds for a special anniversary activity: placing wishes on the hope tree. Everyone huddled around tables - the adults in tiny wooden chairs with the toddlers in their laps. Teachers handed out markers and colorful paper flowers. The moms and dads, grandmas and grandpas were asked to write their child's name in the center of the flower, and a wish for the child. 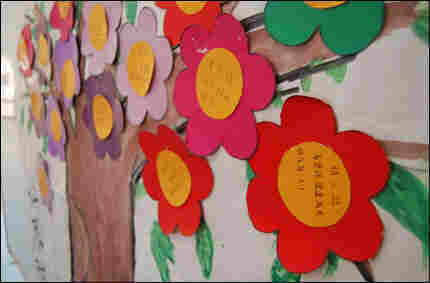 Then one by one, they approached a large poster drawing of a tree and picked up the little ones so they could stick their own flowers on the tree. Afterwards, when everyone was eating cake, I went to get a close up look at the flowers. Overwhelmingly, the parents and grandparents had one wish: May you grow up to be healthy and happy. A simple wish for not so simple times. *It turned out to be President Hu Jintao, not Premier Wen, who came to the region today. Hu attended a memorial ceremony in Yingxiu, the quake's epicenter.